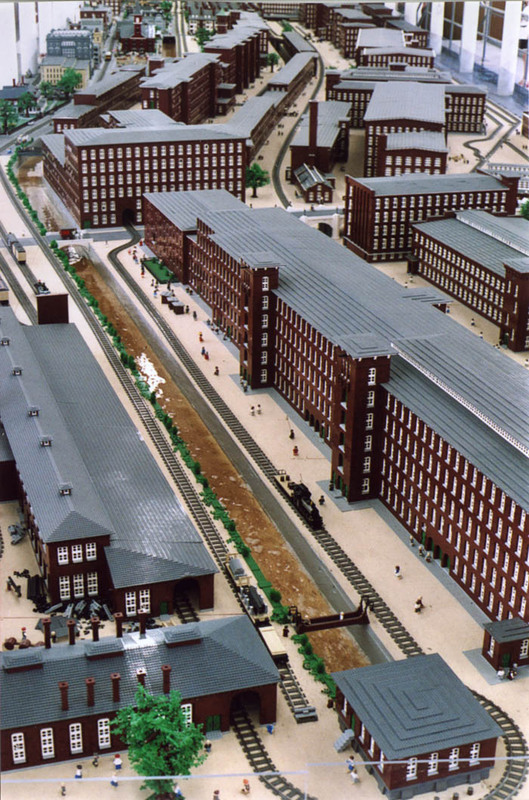 The Lego Millyard Project at SEE Science Center in Manchester, New Hampshire, sculpturally depicts Manchester’s Amoskeag Company mill complex, which was touted as the largest textile manufacturer in the world by 1915, and dominated life in the city from when it began construction in 1839 to when it finally shut down in 1935. How does a sculpture project like this compare to projects like the DeCordova Museum’s upcoming “Trainscape” exhibition or Boston sculptor Brian Burkhardt’s faux museum dioramas? Burkhardt sculpts imaginary plant-machine hybrids to tell cautionary tales about pollution and bioengineering. The Lego Millyard uses the novelty of Legos (“the largest permanent Lego installation at minifigure scale in the world”) to get us thinking about the power of industry to dominate our lives, to control our natural resources and geography, to benefit and harm our communities. The sculpture was constructed from 2004 to 2006, and dedicated last Nov. 29. It consists of some 3 million Lego bricks and some 8,000 little Lego people. Our head of research oversight points out that because we’ve all worked with Legos, we can look at it and feel a sense of the vastness of the sculptural undertaking. At the same time the Legos' bland cheery uniformity seems to radiate some of the drudgery of factory labor. And maybe lurking underneath is the question of whether the mill owners saw the real buildings and people as some sort of lucrative playthings. Not that the Lego sculptors necessarily had such thoughts in mind. Amoskeag mostly turned raw wool and Southern cotton (note the underlying economic connection to Southern slavery) into cloth, but it also produced textile machines, locomotives, and, during the Civil War, guns. In the model, real water flows through three canals, the source of the mill’s power for much of its life (coal was also used later – represented here by a giant mound of black Legos) and the reason it was situated where it was. “Amoskeag had the greatest water power of any textile mill in the United States,” a sign proclaims. A trolley and train chug through the scene, with built-in cameras that broadcast see train-eye views on a screen above that put you right into the scene (see here and here). 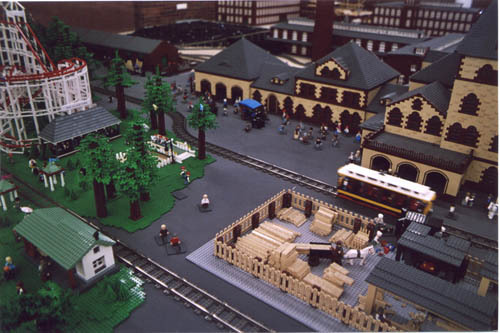 There are also blocks of brick mill housing, a cut-a-way representation of the Jefferson Mill building revealing all the busy looms inside, the downtown strip of Elm Street, a farmers market, cathedrals and a (stationary) amusement park with swan boats, Ferris wheel and roller coaster. Museum signs talk about labor history. Some 15,500 men, women and children worked here in 1912, roughly equivalent to the entire population of North Adams, Massachusetts, today. “Manchester was known as the ‘strikeless’ city because the workers did not hold a major strike against Amoskeag until 1922,” a sign explains. Workers went on strike then because the company sought to cut wages 20 percent while increasing hours. After nine months the company dropped its wage demands, but the strikers returned to longer hours. The strike lost the mill business; it “never regained its position in the industry,” the museum explains. This was followed by a violent 1933 strike, and in 1935 the mill shut down for good. The Lego sculpture is arranged in one giant rectangle, making much in the middle difficult to see. The model feels generally inert, which stands out in a museum devoted to interactivity (kids generally ignored the Lego Millyard during my visit). But SEE is housed in one of the many repurposed mill buildings that still line about a mile on the east side of the Merrimack River. When you go back out into the neighborhood, you recognize buildings and suddenly see the town in a new light. “The Lego Millyard Project,” SEE Science Center, 200 Bedford St., Manchester, New Hampshire, ongoing. Seriously, I don't think any of us creators saw it this way. While I think many of us would appreciate the insights you gain from this project, I think most of us were just trying to build something wicked cool with Lego.